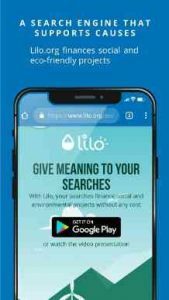 Lilo Browser : With Lilo, your searches finance social and environmental projects without any cost. Lilo gives 50 % of its revenues to the projects you choose ! Each Lilo query provides your with a token, displayed as a drop of water. At any point, you may choose to donate these drops of water to one or more organizations. Lilo then converts these drops of water to money and transfer it to the organizations. These organizations are easily accessible on lilo’s main page and the search results page. Lilo funds dozens of organizations involved in social and occupational integration, access to care, circular economy, climate change prevention and education, reforestation, sustainable farming, and access to sports. We strive to add additional organizations weekly. Lilo works like any popular search engine: You types keywords and Lilo returns matching results. Our algorithm – that relies on the major search engines results – ensures relevant results are displayed first. Lilo strives to offset its environmental impact. Lilo donates 5% of its revenue to offset its carbon emissions to Good Planet Foundation, a foundation accredited by the Gold Standard. Join Lilo today and make a difference! Same than goggle but helping the planet in the same time you are web surfing is Great !!!! Lilo is just amazing to respect my privacy and my life and to contribute to the planet… love it. Nothing else to add.